We are Maine’s premier bike shop, known for providing high quality bicycles, bicycle parts, helmets, bike accessories, and tune-ups & repairs. Rainbow Bicycle has been Central Maine's premier bike shop since 1982. We have earned a reputation as the go to shop for quality bikes and service. We pride ourselves on customer service! Purchasing a bicycle can often be very intimidating and confusing. Our staff always make it easy to purchase the right bike at the right price. We stock one of the biggest selections in the state from bikes to all the accessories that go with it. "I've been fascinated by bikes since I saved up money mowing lawns to buy a Yellow Schwinn Continental 'racing bike' when I was 13. By 15 the bike was a thing of the past. Nearly 20 years later I hauled it out to exercise. I was hooked from then on. I bought the shop 18 years ago and it was the best thing I ever did! Nothing gets me more excited than talking to new customers about getting a bike. Whether it's for a little kids bike, a first time bike riding adult, or a serious enthusiast who wants to take it to the next level, I just love to talk about bikes." Ben tried to not follow in his father's footsteps. 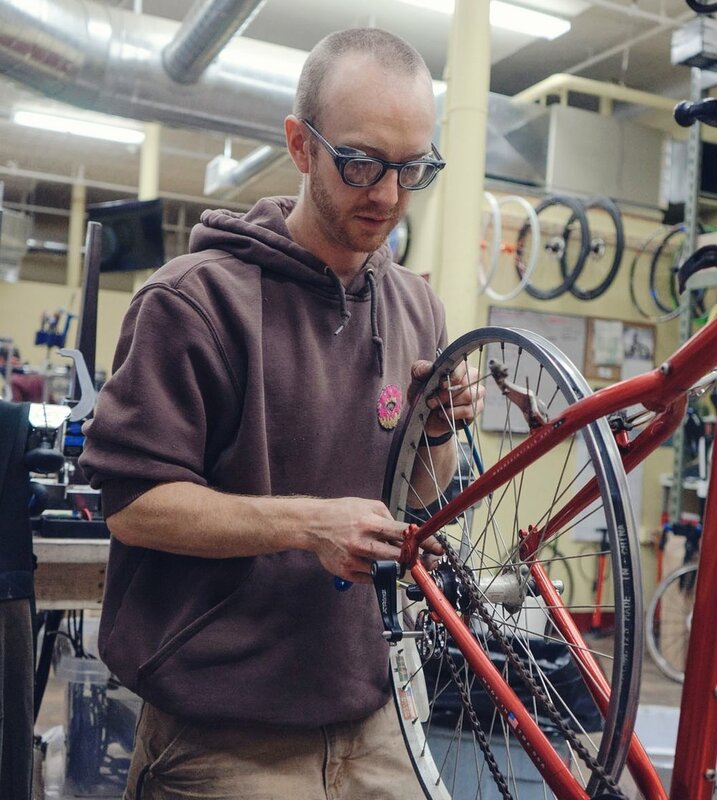 He went to college in Boston, but while there worked at a bike shop in the summer, then moved to New York and again worked at a bike shop. Ben eventually moved back to Lewiston and suddenly saw the light! 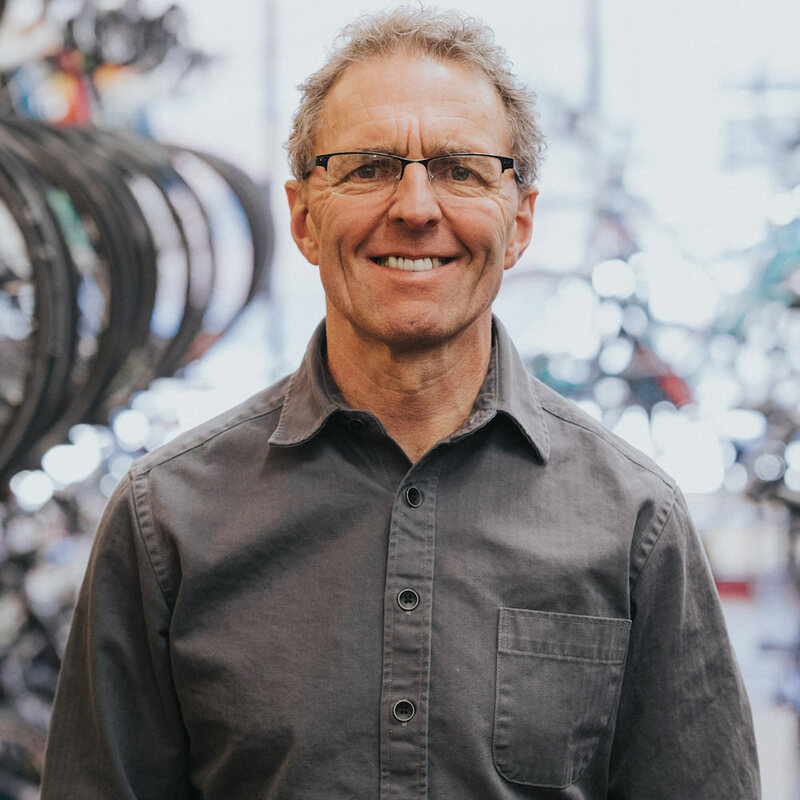 He started racing road, mountain, and cyclocross bikes along with commuting. He became a real student of the business. Ben is the guy you want to talk to when starting to look for a bike. He has ridden them all and has a wealth of information he loves to share. Josh is the most experienced mechanic we have ever seen in our 18 years at the shop. He came to us from Philly a few years ago and has become a fixture at the shop. We call him the Wizard because he can find a solution to almost any problem. He can figure out how to bring any bike back to life at a reasonable price. Josh loves 90's mountain bikes, single speeds, and bikes built with utility and durability in mind. If you have a bike problem that nobody else can fix, bring it to Josh. Mowgli is a dog of many talents. Door greeter, crumb cleaner, occasional face licker, and overall good boy. He loves muffin bits, peanut butter, food on kids faces, and leftover burrito fillings.